The sophisticated lobby bar located in the Delano offers a curated craft cocktail menu that will delight your senses as well as your sense of humor. The creative cocktails’ names are full of hidden meanings and historical references. 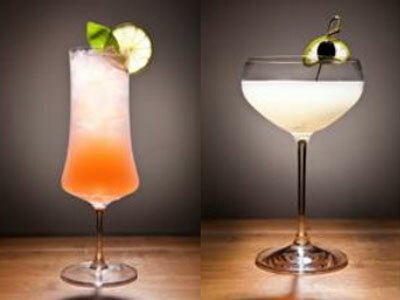 The cocktails themselves are full of one-of-a-kind spirits and made from exclusive recipes. A whimsical variety of appetizers and small plates provides an array of options to suit any taste. The atmosphere of the lobby bar will evolve throughout the night, culminating with live entertainment and the hottest DJ’s. Franklin is glowing with golden light and the dark navy sheers that drape to the floor provide an intimate and sophisticated environment. Franklin is keeping with the luxury feel of the all-suite luxury promised by the Delano. Guests may now purchase a mini-barrel of the award-winning cocktail “Comfortably Numb” to take back to their room. The Comfortably Numb cocktail is made from Delano Las Vegas’ Exclusive Woodford Reserve Double-Oaked Bourbon and Giffard Vanille & Coffee Bean-Infused Carpano. My wife and I stayed at the Delano hotel and we decided to check out Franklin one of the nights. We couldn’t have asked for a better evening, it was so classy and there were so many options when it came to appetizers and drinks, that we ordered a ton! This bar has a very sophisticated feel to it. It feels very private and makes for a great evening out with your hubby. My husband and I had a wonderful, romantic night at Franklin. It’s a smoke free atmosphere which I loved. I recommend this place for a memorable night out.